You are trying to solve your own problem and not burden others with it. You want to figure out why you feel the way you do and what to do about it. Of course you feel confused and overwhelmed. When you are in emotional pain and don’t know where to turn, and you are looking for answers, you might not even know what questions to ask. Furthermore, you think you are the only one in the world who has your problem, and you are ashamed to tell anyone you simply don’t know what to do. That’s where I come in. For 35 years, I have been helping people just like you take control of their lives and easily master the ordinary problems of living that almost everyone encounters. As a life coach, psychotherapist and educator, I know that therapy is not the only way people solve problems. Will I ever get over feeling inferior? How can I keep promises to myself? Will I always be depressed? How can I stop feeling scared? How can I avoid hurting someone’s feelings? How can I change without losing myself? Do I need a therapist? These are real questions asked by real people — people I have helped — people just like you. When you are searching for answers, you need two things. You need to know that you are normal! And, You need to know what to do, NOW! Now You Can Get The Answers You Need. 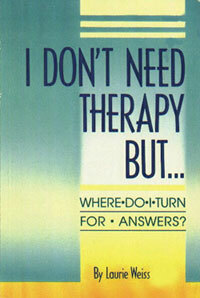 I have just finished revising my time-tested book, I Don’t Need Therapy... but Where Do I Turn for Answers? I wrote it for people like you — people who grew up in difficult family situations — people who look normal and ordinary on the outside, but are secretly insecure and confused and are searching for answers to important questions. Here you’ll find answers to a total of 22 questions that my clients frequently ask. Answers you need to feel in control of your life. How to use your feelings as important signals, even if your family told you that it was stupid or wrong to feel them — and certainly didn’t tell you what to do about them. Four magic questions to answer that tell you what to do when you are paralyzed by fear. How to know what is really important to you, even though you‘ve stopped paying attention to your own needs. A simple technique to quiet and relax yourself — in 5 minutes. How to unhook from the things that cause you to over-react. Defuse a touchy situation with a co-worker. How to stop feeling like a victim, so you can solve problems instead of blaming others for causing them. Seven questions to answer to help you decide between what you know you should do, and what you want to do. What to do instead of constantly comparing yourself to others. How to tell the difference between signs of trouble and normal changes in a healthy relationship — even though you don’t even know what a healthy relationship looks like. What‘s wrong with trying to be fair — and what to do instead. Seven surprisingly simple questions to answer so you can procrastinate and still get done on time. Gentle strategies for changing, even when everyone you care about wants you to stay the same. Two things to avoid doing and five things to do instead when you visit your family. How to decide if you really do need therapy. Now I want to be clear that I am not a psychic or a magician. I am a listener! For 35 years I’ve been listening to discover what people really need. And I help them get it! I have a Doctorate in Health and Human Services, and a Masters Degree in Psychology. I am also a Master Certified Coach. I specialize in helping people cope with change. In nearly 35 years of practice, with four published books and many e-books and articles, I have helped thousands of ordinary people live happier lives, even when they are overwhelmed and confused. You’ve got to take some constructive action right away or you will lose even more energy. Remember, everything you do right now is either helpful or harmful to reclaiming your own control over your life. Only you can do it. I Don’t Need Therapy... but Where Do I Turn for Answers? Will give you specific step-by-step strategies you can start today. You need to take the first step right now. When you click on the button below, you’ll be taken to a secure order page for your credit card information. We use a third party secure processing company so your order information is kept completely confidential — only the processing company and your credit card company access the information. The whole process takes just a few minutes and you’ll be reading your book less than 10 minutes from right now. When you get the book, scan it a couple of times and read the parts that jump out at you right away—then go back and read it cover to cover. Try some of the strategies for a few weeks. You’ll notice a difference right away, and it will encourage you to try some of the other strategies. You will use this book as a constant source of support and information as you take control of your life. I Don’t Need Therapy, but Where Do I Turn for Answers? comes with a 100% Money Back Guarantee. Read the book cover to cover and try the strategies risk free. If the strategies and information in the book aren’t helpful to you — we’ll cheerfully refund your money, and you can keep the book. Just click on the button below to order your book safely with our secure order form. I can help you, But you’ve got to take the first step. PS - Every strategy and idea in I Don’t Need Therapy... but Where Do I Turn for Answers? is a proven winner — a strategy my clients have used successfully in real world situations. They are the same strategies I have used for years in my Life Coaching practice to help hundreds of people like you take control of their lives. If you get stuck, or need private coaching, I’ve included my phone number and contact information in the book, so you don’t have to go through this alone.